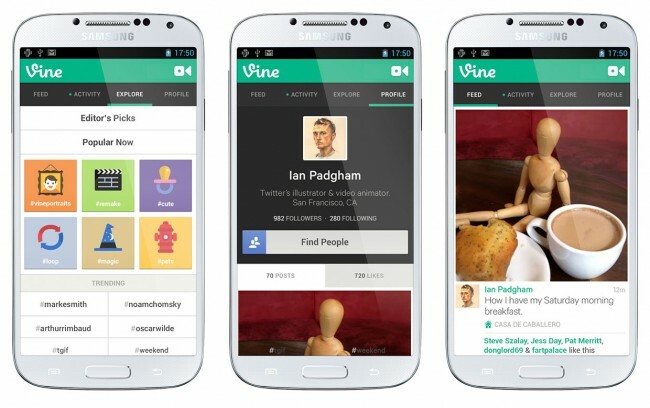 Vine, Twitter’s popular short-clip video sharing service that was previously only on iOS, will be available on Android today. For those not familiar, Vine allows you to record 6 seconds of video (with sound) and then share it with the world, much like you do a Tweet. It becomes interesting in the idea that you can pause and continue recording simply by touching and releasing your finger to and from the screen. Current Vine users have created all sorts of 6-second stop motion clips that are highly entertaining, many of which continuously loop. When it launches later today on Android, we’ll see a version that’s actually a step or two behind the iOS version. Thankfully Twitter claims that this won’t be the case for long, and updates “including front-facing camera, search, mentions and hashtags, and the ability to share to Facebook” are on the way. So yeah, it’s sort of half-baked for the moment, but at least you’ll be able to give it a spin and get the hang of things. They did also mention that they have features on the way which may only be possible on Android, so at least you have that. Again, the Play store link isn’t live yet, but should be at some point. We’ll be sure to let you know as that happens. Update: It’s now live in the Google Play store!